Boston is home to some of the world's best hospitals, but apparently not the best grammar. 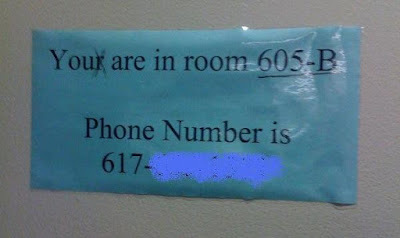 I hope my brother's friend's surgeon showed more attention to detail than the writer of this sign. 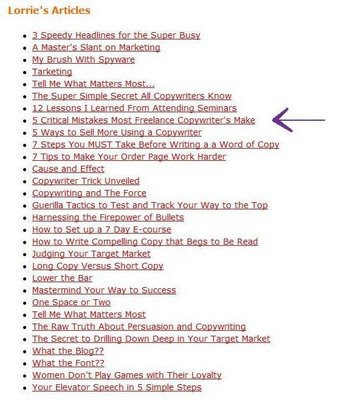 An anonymous reader sent me a link to a web site called Red Hot Copy that provides tips for writing marketing copy. Sadly, the writer should have taken some of her own advice. 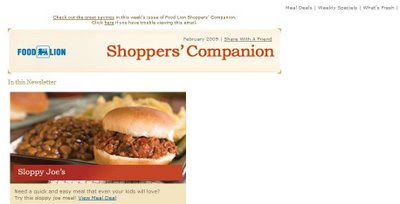 Before you hire writers for their article writing services check out their credentials and portfolios first to make sure they won't commit silly mistakes such as the one below. 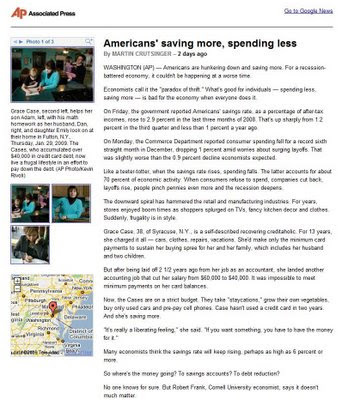 See the headline next to the arrow in the screenshot below. Mistake #6: perpetrating an apostrophe catastrophe when you want readers to see you as a writing expert. Unless, of course, only one child lives in Lexington and he owns something called an "Eat Free." Thanks to Alison for spotting this one. Art found an apostrophe catastrophe in the print copy of Canada's Globe and Mail. See the headline in the screenshot below. The comma is unnecessary, as well. Art noticed that the story was from the Associated Press, so he did some research to find out where the error originated. It turns out that the AP's original headline also used an incorrect apostrophe. 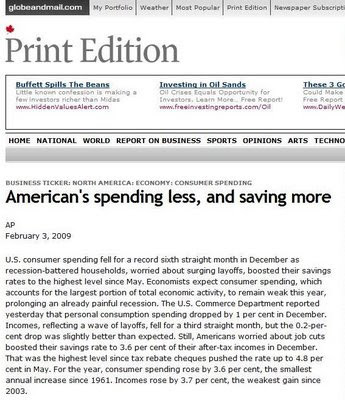 While it could be argued that Americans possess their spending and savings, I think the headline should be "Americans saving more, spending less" with an implied verb "are." "I wonder what Canadians' are doing," Art quips. Also, check out the name of the woman who is quoted in the article. Was Grace's maiden name so bad that she decided to go all Dr. Seuss after she got married? 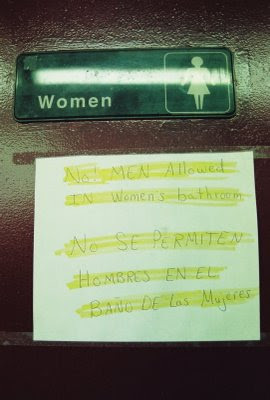 The improperly placed exclamation point implies that men are allowed in the women's bathroom. Perhaps these are the same men who were working in this gym locker room. Thanks to Jen for sending in the first exclamation point catastrophe! 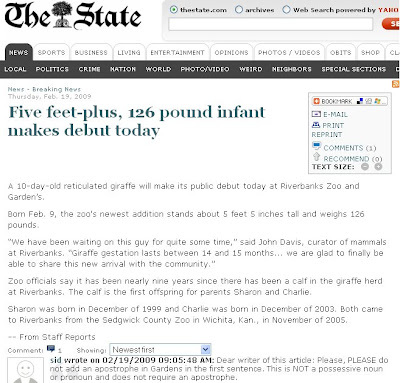 The reporter who wrote this article must have been so excited about seeing a baby giraffe that s/he forgot how to use proper punctuation. Check out the apostrophe catastrophe at the end of the first sentence. Thanks to Ashlie, who sent me this screenshot, The State corrected the error on its web site, but it still makes the blog anyway because I'm evil like that. Looks like someone named Sid noticed the mistake, too. If you want to see photos of baby giraffes and other adorable baby animals, check out ZooBorns. The cuteness is overwhelming. Don't look too hard at this image or your head might explode. 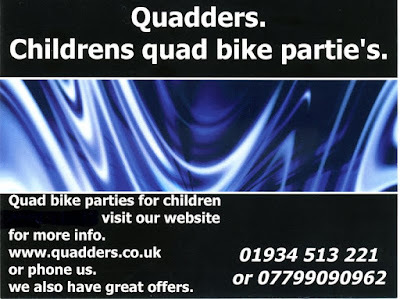 With the missing apostrophe in childrens, the errant apostrophe in partie's, and the spacing and capitalization problems, this is one of the worst catastrophes I've seen in a while. 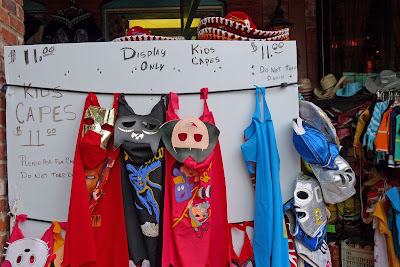 My dad took a business trip to San Antonio, Texas, recently and was disturbed to see that kids and capes were on sale in Market Square for $11. He writes, "Luckily, it seemed the items were for display only, and customers were advised not to take them down." Thanks to my dad for this example of how omitting an apostrophe can really give the wrong impression. Drinking Miller Lite on St. Patrick's Day is bad enough, but screwing up the punctuation in the name of the holiday is even worse. Looks like someone ripped off the leprechaun's arm in anger. It wasn't me, I swear! The photo above was taken in the bathroom of a dive bar. I'm classy like that. 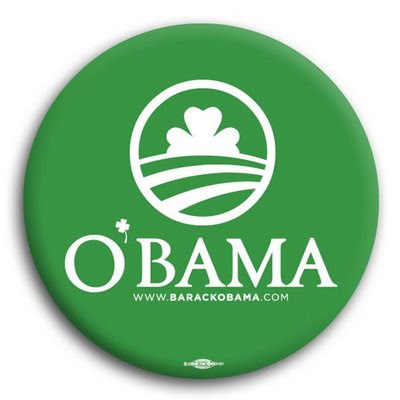 Everyone was Irish yesterday, including President Barack O'Bama. Addressing the visiting Irish prime minister Brian Cowen, the president said, "Taoiseach, I hope our efforts today put me on the path of earning that apostrophe." Happy St. Patrick's Day, everyone! I'd better post something before I go out and start drinking or else I might commit my own grammatical errors. Case in point: the person who printed this shirt was clearly drunk. Thanks to Apostrophe Catastrophes fan Kim for sending me this photo. Kim says that her husband received this shirt as a gift but can't bear to wear it. I don't blame him. What is it with its/it's confusion on shirts? OK, I'm off to look for corn beef and cabbage somewhere near my office. Sláinte! Except without the apostrophe catastrophes. 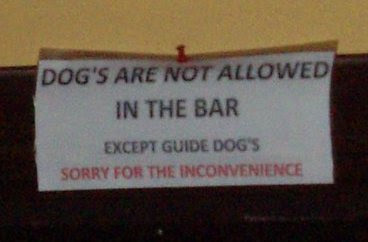 Thanks to Jane for uploading this photo to the Apostrophe Catastrophes facebook group. 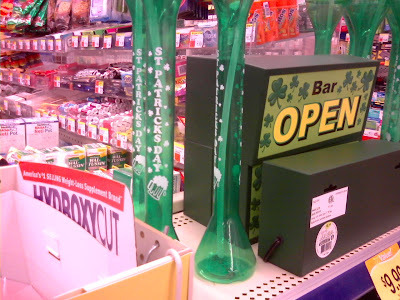 There are many problems with this St. Patrick's Day cup that I found at Walgreens. Much like this product, the shape does not lend itself to proper punctuation, so we're missing an apostrophe and a period. Even stranger, it appears that this cup is intended for beer, yet it has a straw. That's just wrong. 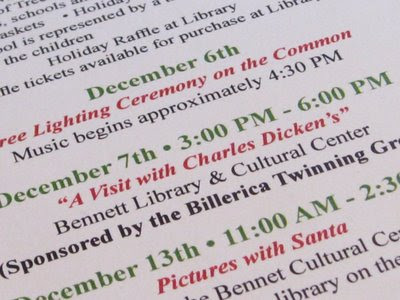 This flyer is promoting an event at a library, but I sincerely hope that it wasn't written by a librarian. Regardless of who wrote it, it's too shameful for words. It might actually make Mr. Dickens turn over in his grave. I am truly appalled. Thanks to Doug for taking this photo and telling me about it on the Apostrophe Catastrophes facebook group. This is one of the most egregious apostrophe catastrophes I've seen so far. The Greatest Gift I Have Ever Received --- Really! My co-worker Kevin came over to my desk today and presented me with a pin that he bought at a thrift shop in Jamaica Plain. 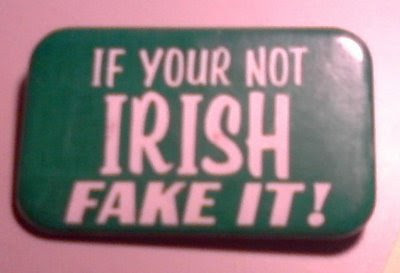 With its grammatical errors and timely message, this pin is the most perfect St. Patrick's Day gift I have ever received. I plan to wear it every day for the next week. The Happy Medic wonders, who is this Give person, and what's wrong with his/her back? The description contains an apostrophe catastrophe (it's instead of its) and a semicolon following a comma. It's no J. Peterman catalog. With the economy in the dumps, many people are selling off their jewelry. This company should have pawned an earring to pay for a proofreader. Yours is already possessive and doesn't need an apostrophe. Thanks to Hanika from California for sending me this internet ad.